Marathon running is becoming increasingly popular in China, even if people do tend to cheat from time to time. What better way to visit another part of the country than by running a marathon or a 10km? You can compete in the race and then spend two or three days exploring the city — if you can still walk! If you’re tempted to get your running shoes on, below are some basic tips and five marathons in China that are well worth the sweat. Check regularly for announcements – Runners will need to register on the official websites to join the races, but unfortunately, many Chinese marathons do not yet enjoy the kind of organisation of their global counterparts. Dates are often not confirmed until close to the race day and there can be significant fluctuation year-on-year on the date itself. The best way to make sure you don’t miss out is to set personal reminders to check the related websites. Don’t rely on the organisers sending out news. Check the Chinese version of event info – Some of the newer or smaller marathons in China do not provide English web pages for entrants or, if they do, the English is not very clear. Even when it does appear to make sense, it's worth asking a Chinese friend or colleague to help check the Chinese source. There are often important details lost in translation. Be prepared for the Chinese climate – Long-distance running is tough at the best of times, and the Chinese climate is not always the most conducive to exertion. Even experienced runners should take stock before attempting a marathon here. Humidity and air quality can really impact your performance and, as a result, you need to be extra careful if you feel nausea, chest pain or breathlessness. If you’re okay with all of that, here are five marathons in China to consider. Xiamen is perhaps lesser-known internationally than other places in China, but this seaside city is one of the country’s genuine delights. The colonial architecture, long beaches and cultured vibe all come together to make a fantastic getaway. So, why not join the Xiamen International Marathon and pound the hell out of a weekend by the sea? The race takes advantage of Xiamen’s beautiful setting. Runners go along the water’s edge, where they can take in the sights, including Gulangyu Island, Hulishan Fortress, and Yefengzhai Beach. Competitors better be ready, though. This race is only available in the full marathon format. But what better way to get horribly sweaty than by looking out onto the water and feeling the sea breeze on your face? It’s pretty much a rule that if you live in China, you have to visit the Great Wall before you leave. It’s just the done thing. What they don’t tell you is that it’s not always a lot of fun. Most visitors’ experience of the Great Wall is shuffling along the Badaling section with thousands of other tourists, in what amounts to a glorified queue. So, if you’re going to visit the Great Wall, why not do it in the most “extra” way possible and run a marathon on it? The run takes place at the Huangya Pass (Yellow Cliff) section and goes past some of the most gorgeous scenery that the wall has to offer. Travel through the real Chinese countryside, explore tiny villages, take in breathtaking mountain scenery and, of course, run along the Great Wall itself. The race is not without its challenges, with elevations of up to nearly 500 meters leading to some steep climbs and descents that would test even the most battle-ready runners. The Great Wall of China Marathon is typically held on the third Saturday of May, with registration usually closing by mid-April. Entrants can choose between full and half-marathons, as well as a 7.5km run. 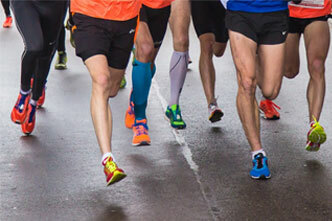 It seems like most marathons take place inside busy cities with competitors running on hard concrete surfaces. There often comes a point where, as a runner, you just want to get out of the city and feel some earth beneath your feet. Step forward, the Genghis Khan Festival. Don't let the event’s namesake scare you! The only thing ferocious about this race is the Marathon distance. However, organisers also offer half-marathon and an 11km for less-experienced runners and tourists looking for a unique way to explore the countryside. And what a countryside it is! The small sand and grass trails are a million miles away from the busy, congested cities of China. The nature and scenery of Inner Mongolia make for a truly unique backdrop. There’s also a 200km mountain bike race during the three-day festival, just in case you’re considering swapping your running shoes for pedal power. Xi’an is one of the most visited cities in China; when you look at its landmarks and the heritage, it’s not hard to see why. Most famous of all are the Terracotta Warriors, the panda centers and, of course, the ancient City Wall. In terms of distances, the Xi’an City Wall Marathon is not as intense as others in China. There’s no full marathon option, and there are a couple of shorter distances for casual runners. The short races allow the less serious competitors to really take in the city and savor the experience of running along Xi’an’s City Wall. After all, it’s not often you get the chance to race on a 14th century UNESCO World Heritage Site. City running has never been such a pleasure. 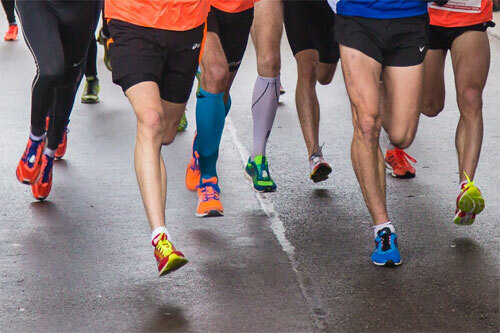 If you’re kind of an attention seeker and looking to compete with some of the of world’s best runners, the Shanghai International Marathon is the one for you. The race starts by the iconic Bund, overlooked by the towering Pudong skyline. Runners head south along the Puxi side of the Huangpu River, finishing at Shanghai Stadium, just past Longhua Temple. If you just want to use the race as an excuse to visit Shanghai, organisers also offer 10km and a Mini Marathon, otherwise known as a 5km. That way, you should still be able to walk around the next day and do some sightseeing in the Former French Concession.